Did Obama EPA/DOT Officials Lie to Congress? Issa’s letters — to National Highway Traffic Safety Administration (NHTSA) Administrator David Strickland, EPA Assistant Administrator for Air and Radiation Gina McCarthy, and EPA Director of Transportation and Air Quality Margo Oge — are identical in content. This matters for three inter-related reasons: (1) EPA is currently regulating fuel economy by setting motor vehicle greenhouse gas emission standards even though the Clean Air Act provides no authority for fuel economy regulation; (2) EPA in June 2009 granted California a waiver to establish motor vehicle greenhouse gas emission standards despite the Energy Policy Conservation Act’s (EPCA’s) express prohibition (U.S.C. 49 § 32919) of state laws or regulations “related to” fuel economy; and (3) the California waiver, by threatening to create a market-balkanizing “regulatory patchwork,” enabled the Obama administration to extort the auto industry’s support for EPA’s new career as greenhouse gas/fuel economy regulator in return for California and other states’ agreement to deem compliance with EPA’s greenhouse gas/fuel economy standards as compliance with their own. As I will demonstrate below, greenhouse gas emission standards are highly “related to” fuel economy standards, and the administration witnesses cannot possibly be ignorant of the relationship. Do their denials of plain fact rise to the level of perjury? Chairman Jordan: I guess maybe here’s the question — I’m not a legal scholar on this — but it seems that when you read the statute [EPCA], it talks about a regulation related to fuel economy standards, and greenhouse gases are certainly related to fuel economy standards, is that right? Administrator McCarthy: They are closely aligned but they are different, Mr. Chairman. Vice Chair Buerkle: I just have a quick question for the three of you. It’s a yes or no question, if you wouldn’t mind. Are the greenhouse gas rules — either EPA’s or the California rules — are they they related to fuel economy? Mr. Strickland, yes or no? Administrator Strickland: No, they regulate greenhouse gas emissions. Administrator McCarthy: They regulate greenhouse gas emissions. Ms. Oge: They regulate greenhouse gas emissions. Vice Chair Buerkle: So they’re not related to fuel economy, under oath. Administrator Strickland: No. They’re greenhouse gas emission regulations. Administrator McCarthy: We do not regulate fuel economy standards. Vice Chair Buerkle: And all three of you agree with that? Motor vehicle greenhouse gas emission standards implicitly – and inescapably – regulate fuel economy. EPA and NHTSA confirm this – albeit not in so many words – in their joint May 2010 greenhouse gas/fuel economy Tailpipe Rule. Four scenarios of future stringency are analyzed for model years 2020 and 2025, starting with a 250 grams/mile estimated fleet-wide level in MY 2016 and lowering CO2 scenario targets at the rate of 3% per year, 4% per year, 5% per year, and 6% per year [p. viii]. The 54.5 mpg target represents a negotiated compromise between the 4% per year (51 mpg) and 5% per year (56 mpg) CO2 reduction scenarios (p. ix). 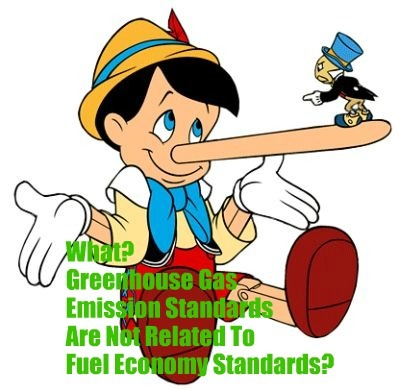 That the California greenhouse gas motor vehicle emissions law, AB 1493, is highly “related to” fuel economy is obvious from CARB’s 2004 Staff Report presenting the agency’s “initial statement of reasons” for its regulatory program. The Staff Report’s recommended options for reducing greenhouse gas emissions (Table 5.2-3) are identical in substance, and often in detail, to fuel saving options presented in the National Research Council’s (NRC’s) 2002 fuel economy report (Tables 3-1, 3-2). A few options in the CARB list are not included in the NRC list. In each case, however, the CARB option is a fuel-saving technology, not an emission-control technology. In addition, the text of AB 1493 clearly implies that CARB is to regulate fuel economy. AB 1493 requires CARB to achieve “maximum feasible” greenhouse gas reductions that are also “cost-effective,” defined as “Economical to an owner or operator of a vehicle, taking into account the full life-cycle costs of the vehicle.” CARB rightly interprets this to mean that the reduction in “operating expenses” over the average life of the vehicle (assumed to be 16 years) must exceed the “expected increases in vehicle cost [purchase price] resulting from the technology improvements needed to meet the standards in the proposed regulation” (Staff Report, p. 148). Virtually all of the “operating expenses” to be reduced are expenditures for fuel. The CARB program cannot be “cost-effective” unless CARB regulates fuel economy. CARB is regulating fuel economy, which is prohibited by EPCA. Since EPA contends that its greenhouse gas/fuel economy motor vehicle standards compel the agency to regulate greenhouse gas emissions from large stationary sources, the administration witnesses also could not acknowledge the obvious without admitting that EPA’s entire greenhouse gas regulatory agenda rests on shaky legal grounds. * I testified at the Subcommittee’s October 12 hearing on the first, private-sector witness panel, which also included Jeremy Anwyl (Edmunds.Com), Roland Hwang (Natural Resources Defense Council), and Scott Grenerth (Independent Trucker). The three Obama officials testified on the second, public-sector witness panel. Next post: Why Resort to Shenanigans to Make Green Energy a Reality?